If you go down to the woods today……actually if you had gone between Sutton Bridge, Lincolnshire and Corby, Northamptonshire last Sunday you would have been in for a VERY big surprise! In the form of a Leicester Heavy Haulage 8×4 680hp MAN TGX, carrying a 20ML x 6MW x 6.2MH and weighing in at 29,000 kg. For those of you outside the UK, our maximum dimensions for a vehicle are 5M wide and 5M high. So in order to move such a large piece of cargo we have to apply for a special route from the Government that should take you from start to finish missing as many low or narrow obstacles, but this isn’t always the case as you will find out reading this. There are also plenty of wires across our roads, low trees and of course the UK’s love of signposts and street furniture means that along with Police and private escorts they are a convoy of other vehicles on the job, including telephone company vans, electricity vans and council vans to name but a few and also plenty of folk on foot taking photos and hoping their house’s won’t get hit! There were a lot of issues with the route due to the sheer size of the piece. It took us 5 months to find a route as the 2 that we were supplied with by the Police (the ones going to be used and cancelled a couple of days before) were either going to hit a bridge or electrocute the driver. I had to drive the route with a tree surgeon as we needed a large amount of branches to be cut along the journey. The journey started at 6.30am on Sunday with the piece loaded onto one of our wafer bed Nooteboom Low Loaders with the extra beam section slotted in to accommodate the length of the load (17m along the bottom / 20m including the cone). The main part of the route followed the A17, A52 and A15 until Bourne and then veered off cross country to a place called Carlby. In Carlby we had to pay a farm machinery dealer to use their courtyard on Sunday to lift the Silo from the Low Loader onto the back of a 5 Axle 850mm deck height, steerable, Nooteboom semi low loader for the second leg of the journey. 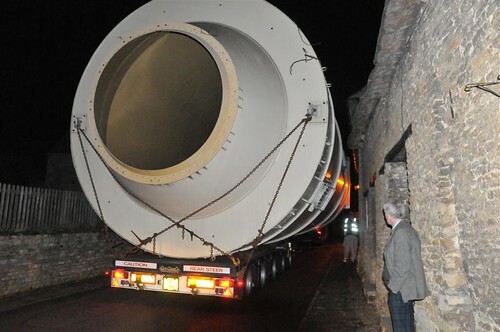 This is due to the original Low Loader being too long to negotiate a very tight left turn in the village of Great Casterton, near Stamford. Once we had made this turn the load then had to cross over the A1 and travel towards Rutland Water. The route then ran through the countryside alongside Rutland Water via North Luffenham and Edith Weston through to the A47 where we turned East and then South onto the A43. 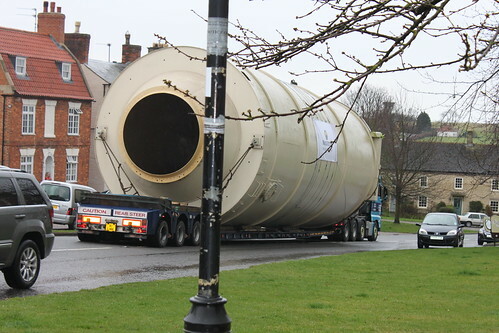 Due to the load now being 7.03m high on the Semi Low Loader we then had to leave the A43 and travel through a very narrow village called Bulwick in Northamptonshire. We had to arrange a leaflet drop in this village and speak to locals to ask them to keep the road clear of cars as at some points along the main street we were only inches away from the houses on either side. We then got back on the A43 and arrived at site at 8.30pm that night. 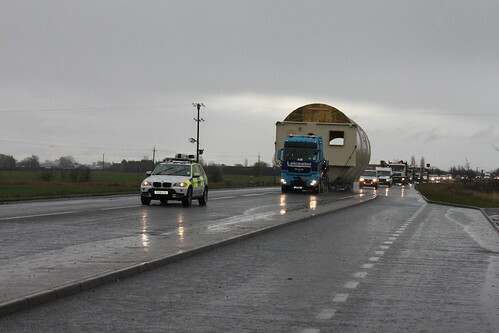 The whole thing was escorted by ourselves, Lincolnshire Police, BT Openreach and Western Power. We had to have over 100 electrical lines either isolated (turned off) or lifted to allow us to get through. 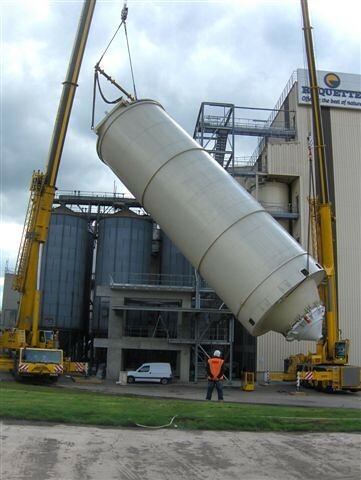 The Silo is now installed and is to be used to hold 250 tonnes of grain for the manufacture of animal feed. The whole thing was such a big deal for everyone and it involved so many people in one way or another that it even made the local BBC News. Click the link HERE to see the news clip. 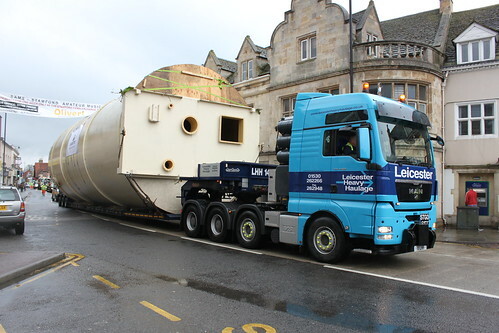 This entry was posted in Guest Writers, Heavy Haulage, MAN, Photos by truckbloguk. Bookmark the permalink.